The Amazon Kindle Touch is Amazon’s new flagship ebook reader which was announced today (28/06/11) and which is due to launch on November 21st. So how does it compare to last year’s Kindle 3? Firstly, the Kindle Touch features a a keyboard-less design, and an IR based multi touch screen. This means you can now touch the screen to navigate, and use gestures to flick through pages. This is the same technology used in other ebook readers such as the latest Nook or Kobo readers, but based on Amazon’s tried and tested UI. 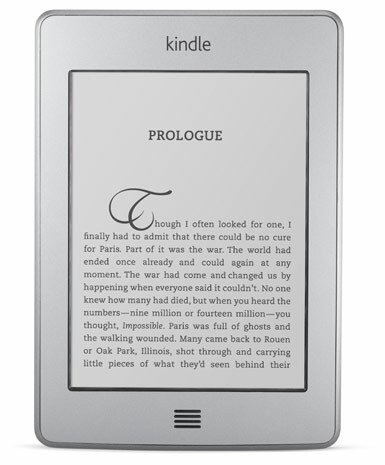 The Kindle touch uses the same Pearl E-Ink display featuring a 600 x 800 pixel resolution at 167 ppi, and 16-level grayscale. So there are no compromises with the new multi touch technology (some other devices such as the early Sony ebook readers had contact based touch screens which meant that the screen needed an extra layer of plastic which reduced the visibility of text. This is not the case with the Kindle Touch). The buttons have unfortunately disappeared, but the device make it up with a smart UI, and responsive touch screen interface. The battery life is similar to the previous Kindle, featuring around 2 months of usage without 3G. Size wise, this ebook reader has a 11% smaller body, with the same 6″ screen size, and is 8% lighter, at only 7.5 ounces. The only downside to the Kindle touch is the lack of keyboard, and 3G connection. If you have a Kindle 3, this might be an actual downgrade as you will only gain a touchscreen and a slightly smaller form factor but lose out on the 3G connection. I would recommend opting for the Kindle 3G Keyboard if your budget can afford it, but if you are looking for a more affordable ebook reader the Kindle Touch is a fantastic buy. Where To Get Your Kindle Touch? The Kindle touch will be launched on November 21st, so I would recommend trying to pre-order your device, as the previous Kindle sold out when it was launched last year. For US users, you can pre-order your device at the US amazon site here. For UK users, we don’t have a pre-order page yet and will update this page when we do! *Update* It looks like the UK will not be seeing the Kindle Touch this year! Instead we recommend sticking with the Kindle 3G which is our number 1 rated ebook reader.